Return to Torino, Italy! April 2009! Looking forward to a return to Torino Italy in April 2009 for a workshop/performance with saxophonist Gigi DiGregorio, trombonist Sergio Chiricosta, drummer Joe Poole, vocalist Leora Cashe (now living in Belgium), and bassist Miles Hill (now based in Italy). Tony will be joined by phenomenal drummer Joe Poole (pictured left) and special guest bassists in a 3-night trio performance in downtown Vancouver on Robson Street at O'Doul's Restaurant & Bar! Triple Door w/ Dee Daniels August 22nd..some more 'Jazzinit' ! 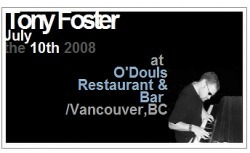 Tony Foster will be joining vocalist Dee Daniels once again..this time in Seattle Washington at a great venue called the Triple Door...it's a unique theatre: "The Mainstage is The Triple Door’s centerpiece. Restored and updated from the bones of the historic Embassy Theatre, this 300-seat performance space is at once timeless and modern. The classic look of the gold-framed, red-curtained stage blends seamlessly with the contemporary, sleek, uncluttered array of half-moon booths and free-standing tables." Tony Foster will perform with Russ Botten on bass and Seattle-based drummer Greg Williamson at the Center for the Performing Arts in backing vocalist Dee Daniels. The trio recently recorded Dee's latest album entitled Jazzinit. The performance on the 26th of June will be recorded by CBC radio! A class of young music students in Torino Italy! While in Torino, Italy, Joe Poole and I had the pleasure to visit an elementary school where one of our hosts Ms. Rosanna Carrera is a teacher. The particular class we visited and performed for happened to be a music class which I can honestly say is one of the best audiences I have ever played for!